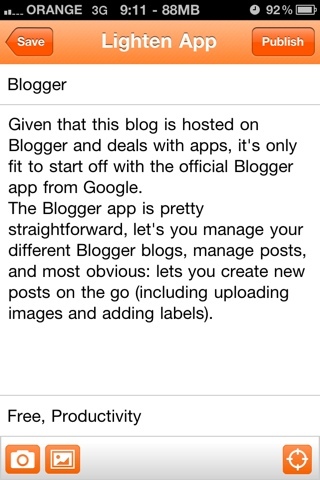 Given that this blog is hosted on Blogger and deals with apps, it's only fit to start off with the official Blogger app from Google. The Blogger iPhone app is pretty straightforward, it lets you manage your different Blogger blogs, manage posts, and most obvious: lets you create new posts on the go (including uploading images and adding labels). As you can imagine, this post was created using the Blogger iPhone app. Would be nice to have advanced functionality like viewing your blog stats, choosing from existing labels, and viewing a preview of your post. But overall the basic stuff works.